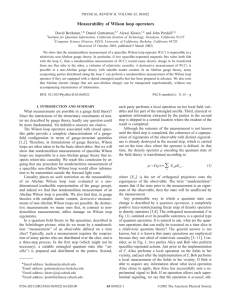 Attempts have been made to describe gauge theories in terms of extended objects such asWilson loops and holonomies. The loop representation is a quantum hamiltonian representation of gauge theories in terms of loops. 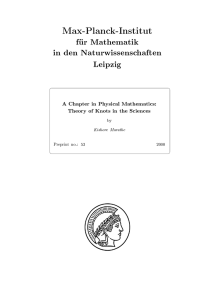 The aim of the loop representation, in the context of Yang–Mills theories is to avoid the redundancy introduced by Gauss gauge symmetries allowing to work directly in the space of physical states (Gauss gauge invariant states). The idea is well known in the context of lattice Yang–Mills theory (see lattice gauge theory). Attempts to explore the continuous loop representation was made by Gambini and Trias for canonical Yang–Mills theory, however there were difficulties as they represented singular objects. As we shall see the loop formalism goes far beyond a simple gauge invariant description, in fact it is the natural geometrical framework to treat gauge theories and quantum gravity in terms of their fundamental physical excitations.The introduction by Ashtekar of a new set of variables (Ashtekar variables) cast general relativity in the same language as gauge theories and allowed one to apply loop techniques as a natural nonperturbative description of Einstein’s theory. In canonical quantum gravity the difficulties in using the continuous loop representation are cured by the spatial diffeomorphism invariance of general relativity. The loop representation also provides a natural solution of the spatial diffeomorphism constraint, making a connection between canonical quantum gravity and knot theory. Surprisingly there were a class of loop states that provided exact (if only formal) solutions to Ashtekar's original (ill-defined) Wheeler–DeWitt equation. Hence an infinite set of exact (if only formal) solutions had been identified for all the equations of canonical quantum general gravity in this representation! 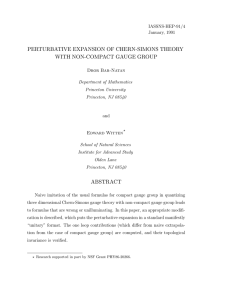 This generated a lot of interest in the approach and eventually led to loop quantum gravity (LQG).The loop representation has found application in mathematics. If topological quantum field theories are formulated in terms of loops, the resulting quantities should be what are known as knot invariants. Topological field theories only involve a finite number of degrees of freedom and so are exactly solvable. As a result they provide concrete computable expressions that are invariants of knots. This was precisely the insight of Edward Witten who noticed that computing loop dependent quantities in Chern–Simons and other three-dimensional topological quantum field theories one could come up with explicit, analytic expressions for knot invariants. For his work in this, in 1990 he was awarded the Fields Medal. He is the first and so far the only physicist to be awarded the Fields Medal, often viewed as the greatest honour in mathematics.